Self-portrait in a Straw Hat, 1782. Élisabeth-Louise Vigée-Le Brun (April 16, 1755 - March 30, 1842), also known as Madame Lebrun, was a French portraitist, who is best remembered for her portraits of Marie Antoinette, and for her disarming self portraits which reflect her life and career at various stages: young motherhood, life in exile during the French Revolution, and mature portraits of European nobility. Today she is generally regarded as the most famous woman painter of the eighteenth century. However, she was unappreciated for many years, not only because of her association with the unpopular ancien regime, but also due to the fact that she competed in a field largely dominated by male artists and their patrons. Her style, influenced by Jacques-Louis David, came into its own as the Rococo period was waning and Neoclassicism's themes became popular as it connected to Greek and Roman times. Influenced by the philosophy of Jean-Jacques Rousseau, her love of naturalism is reflected in her portraits of Marie Antoinette; portraits in which the queen is dressed more simply and is embracing her children. In her later portraits one can see the influence of Romanticism with naturalistic settings involving landscapes and waterfalls serving as backgrounds to her portraits. Vigee-Le Brun worked tirelessly at her craft and career which spanned many decades and several European countries, finding unprecedented success for a woman during a time of great social and political upheaval. While artistic recognition might have been late in coming, her portraits now hang in all the leading art museums of the world including the Louvre. 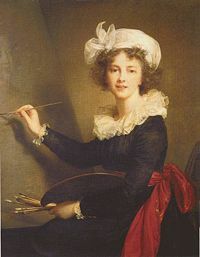 Born in Paris on April 16, 1755, Marie Élisabeth-Louise Vigée was the daughter of portraitist and pastellist, Louis Vigée. In the early stages of her career she would owe a great deal to the connections she made in the art world through her father. She was sent to live with relatives in Epernon until the age of six when she entered a convent where she remained for five years. This type of education was customary for girls from the upper classes who were expected to learn social graces, along with reading, writing and embroidery skills. However, the young Vigee was reprimanded on more than one occasion for drawing on her dormitory walls. "I remember at the age of seven or eight I drew by the lamp a head of a bearded man which I have always kept. I showed it to my father who cried out with joy, "You shall be a painter, my child!" Her father died when she was 12 years old and in 1768, her mother married wealthy jeweler, Jacques-Francois Le Sèvre. This was a difficult adjustment for Vigee-Le Brun who was close to her father, but when the family moved to the rue Saint-Honoré close to the Palais Royal this afforded her new opportunities for drawing. During this period the youthful artist was mentored by masters of the day including Jean-Baptiste Greuze, Joseph Vernet, and Herbert Robert, the latter two whose portraits she painted. By the time she was in her early teens, Elisabeth was painting portraits professionally. In her memoirs, Souvenirs she attests to the fact that she was largely a self taught artist and did not have the opportunity to study under the official curriculum of the Academie, however, she did apply to the less prestigious Académie de Saint Luc, of which her father had been a member, and they willingly exhibited her works in their Salon. 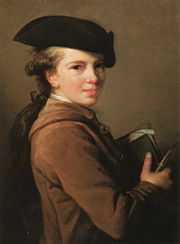 Elisabeth Vigee married art dealer Jean Baptiste Pierre Le Brun in 1776. After a trip to Flanders and Holland in 1781 she became deeply impressed with the use of color by Rubens, and Van Dyck, Flemish masters whose works were displayed in the churches, private collections, and museums of Northern Europe. She sought to achieve similar affects in light and color. In her Self Portrait With a Straw Hat (pictured above), the setting is out of doors and a shadow plays gently across her face. The artist is shown, with palette in hand, undertaking her career fully confident not only in her good looks but in her ability. In her memoir, Souvenirs, Vigee-Le Brun recognizes that it was most likely this painting that was responsible for her admittance in 1783, into France's Académie Royale de Peinture et de Sculpture an almost unprecedented accomplishment for a woman in that era. Her painting Peace Bringing Back Abundance (1780) gave her credence as a painter of historical allegory. A friend of Vigee-Le Brun, Jaques-Louis David was coming to exemplify the Neoclassic style of eighteenth-century art with its focus on universal values of beauty as exemplified by the Roman and Greek models, particularly their statuary. The Rococo style depicted by the pastoral scenes of Jean-Honore Fragonard was quickly losing favor with the public just as the excesses of the French monarchy were leading up to the French Revolution spurred on by the philosophy of Enlightenment thinkers. Vigee-Le Brun seems to have drawn on these various styles and influences to create an aesthetic that was melded from the finest elements of 18th century art. Maternal love, inspired not only by the birth of her daughter, "Julie," but by the writings of Rousseau, were to become a favorite theme of hers. She attempted to portray Marie Antoinette in a maternalistic light, but her attempts to humanize the monarchy only backfired as her French subjects were already turned against their Austrian born Queen consort. However, it was Marie Antoinette's patronage, kindness, and mentoring that inspired in Vigee-Le Brun a lifelong loyalty long after many Royalists had gone to the guillotine. Portrait of Marie Antoinette, 1783. Attributed to Elisabeth Vigée-Le Brun. As her career blossomed it was not long before Vigee-Le Brun was invited to the Palace of Versailles to paint Marie Antoinette. 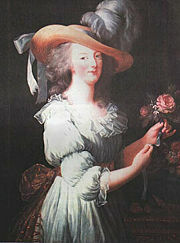 Intimidated at first, Marie Antoinette set her at ease and subsequently was delighted with the results of her paintings. While the first painting of Marie Antoinette was quite formal Marie Antoinette, en robe a paniers, (1778) and shows her in full court regalia with an elaborate head dress, subsequent ones would be far more natural. Vigee-Le Brun welcomed the opportunity to paint Marie Antoinette in the simple attire encouraged by her dressmaker, who had the Queen forgo the oversized hooped skirts and the highly stylized coiffures. These later portraits instead depict Marie Antoinette in flowing white muslin gowns, straw hats and accoutrements more befitting a shepherdess than a queen. However, just as accusations swirled around Marie Antoinette, Vigee-Le Brun was also subject to unfounded criticism and insinuations of scandal - criticism that was often indefensible in the growing climate of discontent in pre-Revolutionary France. In 1789, after fleeing France, she was succeeded as court painter to Marie Antoinette by Alexander Kucharsky whose portraits of the royal family include one of Louis XVII, Marie Antoinette's son who is sometimes called The Lost Dauphin. 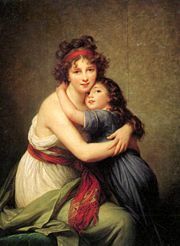 After the arrest of the royal family during the French Revolution Vigée-Le Brun fled France with her young daughter Julie. Italy, birthplace to the Renaissance was a favorite of French painters and she decided to use this opportunity to visit the great works of art there such as the Chapel of the Medicis built by Michelangelo and the Vatican's Raphaels. It was also in Italy where she painted one of her best known self portraits which shows her at her easel wearing a simple black dress and white guaze turban. Already an accomplished artist she was developing into an intrepid traveler, not only doggedly pursuing her painting but raising her child on her own. As author May Gita said in her biography of Vigee-Le Brun, "She had not only survived the greatest crisis of her personal and professional life she was now poised alone to face the multiple challenges awaiting her in her quest for artistic achievement beyond the borders of her native country." During her stay in Italy she found a community of French emigres and was commissioned in aristocratic circles to paint portraits, however she worried about her brother, husband, and the royal family under siege back in France. Her husband was briefly imprisoned, and he and Vigee-Le Brun were forced to divorce in 1794 in a move of political and financial expediency. Although her husband loyally supported her return, he had squandered her earnings from the early part of her career. A music lover, Vienna with its society balls and concert halls is perhaps where she felt the most at home during the years 1792-1795. As official portraitist of Marie Antoinette she was warmly welcomed in the queen's native country of Austria. Two of her portraits executed while there reflect the influence of pre-Romanticism. Her portraits of the Countess Bucquoi and the Countess Von Schonfeld (1793) both display backgrounds with luminous skies, distant mountains and trees. It was during that watershed year of 1792 that she received the news in a letter from her brother that Louis XVI and Marie Antoinette and her former benefactors had gone to the guillotine, an event which deeply affected her and to which she would only refer to as the "awful assassination." When she arrived in Russia in 1795 she turned forty years of age. Once again she was warmly received by nobility and painted numerous members of the family of Catherine the Great who was at the peak of her power and prestige along with the great city of Saint Petersburg. Vigee-Le Brun was impressed with Catherine's patronage of the arts, architecture and sculpture and with her creation of the famed Hermitage Museum. However, mother and daughter parted ways, at least for a period of time, when Julie married a Russian nobleman against Vigee-Le Brun's advice. She was welcomed back to France during the reign of Emperor Napoleon I. Much in demand by the élite of Europe, she visited England at the beginning of the nineteenth century and painted the portrait of several British notables including Lord Byron. In 1807 she traveled to Switzerland and was made an honorary member of the Société pour l'Avancement des Beaux-Arts of Geneva. In 1808 she acquired a country home in Louveciennes, France - a town which would become an idyll of Impressionist painters during the nineteenth century. Once again political turmoil encroached on Vigee-Le Brun's attempts to live peacefully when the Prussian army pillaged and ransacked Louveciennes during the war of 1814. She fled for Paris where Louis XVIII was being installed as a part of the Bourbon Restoration on the heels of Napoleon's exile. Personal loss soon followed when in 1819 Vigee LeBrun's daughter died of what was probably pneumonia. She published her memoirs, Souvenirs in 1835 and 1837 which consisted in part of letters written to friends of Russian and Polish nobility. She wrote about some of the most notable personalities that had lived during an era spanning the Old Regime, the Revolution, the Empire, The Restoration and the July Monarchy - philosophers and thinkers of the era such as Benjamin Franklin, Voltaire and Tallyrand. She stayed in Paris until her death on March 30, 1842 when her body was taken back to Louveciennes and buried in the cemetery near her old home. Her tombstone epitaph states "Ici, enfin, je repose…" (Here, at last, I rest…)...De profundis. As a woman, Vigee-Le Brun overcame remarkable odds during a time of profound social unrest and turmoil in 18th century Europe in order to pursue her artistic career. Throughout her life, she remained a dedicated royalist when many others charted a safer, more politically expedient course. It was her staunch Catholic faith which contributed to her sense of loyalty and her belief in the monarchic tradition and served as the focal point from which she never wavered. She was often maligned for her association with the ancien regime, and although she earned a living as a portrait painter, it was not until after her death that many of her paintings found their rightful place in the great museums of the world. Additionally, it is in recent years, through writings by Gita May and Ann Sutherland that her memoirs, Souvenirs has received renewed attention. Vigee-Le Brun's peripatetic existence as both artist and exile, whose exposure to monarchs, nobles, artists and emigrees gives us an interesting and fresh perspective into an aristocratic world that she was painting almost as quickly as it was disappearing. Vigée-Le Brun left a legacy of 660 portraits and 200 landscapes. In addition to private collections, her works may be found at major museums, such as the Hermitage Museum, London's National Gallery, in Europe and the United States. Her portrait of fellow neoclassical painter, Hubert Robert, is in Paris at Musee National du Louvre. ↑ 1.0 1.1 1.2 1.3 1.4 Gita May, Elisabeth Vigée Le Brun: The Odyssey of an Artist in an Age of Revolution (New Haven, CT: Yale University Press, 2005, ISBN 978-0300108729). "Elisabeth (Louise) Vigee-Le Brun." International Dictionary of Art and Artists. St. James Press. 1990. Reproduced in Biography Resource Center. Farmington Hills, MI: Gale 2009. 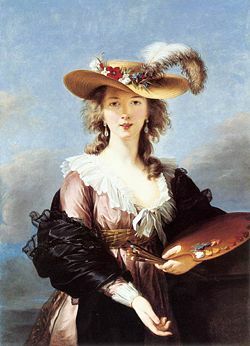 "Elisabeth Vigee LeBrun." Encyclopedia of World Biography. Vol. 19. Gale Group, 1999. Reproduced in Biography Resource Center. Farmington Hills, MI: Gale, 2009. Memoirs of Madame Vigée-Lebrun Digital.library.upenn.edu. History of "Élisabeth-Louise Vigée-Le Brun"
This page was last modified on 27 October 2016, at 20:19.